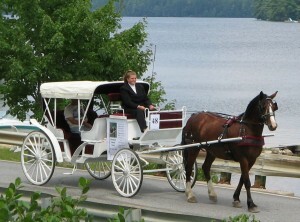 Our carriage is available for weddings, anniversaries and princess parties year round. We do have limits to weather conditions because of the open carriage and the plush interior, some weather is not appropriate for the carriage and driver as well as the horse to be out in. We have an event application for you to fill out that goes over the terms of the service and other information needed to make sure your event goes off without a hitch. Please e-mail directly for a copy of this agreement. We offer the “pumpkin top”, decorations and other considerations to help make your day as special as possible. The traditional look of the white carriage with a white horse and driver in black and white is usually enough to make the whole crowd go “AWWWWW”. A trip for the bride and her “girls” to the alter, a great way to depart with the groom after the ride and opportunities to set up with your favorite background for photos with your event photographer are all great ways to utilize the carriage during a wedding. We will also stay and give rides if that is what you’d like to do! On weekends through the winter from 11 to 3 we plan to offer 15 to 20 minute sleigh rides on the larger sleigh for walk-ins of any size group and by reservation for groups of 4 or more. 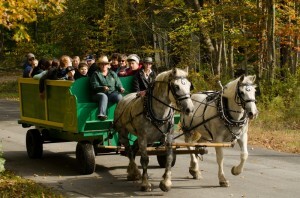 These sleigh rides are $15 per adult with a family rate of $45 for a family of four, 2 adults and 2 children under 12. Sleigh rides will leave every 25 minutes starting at 11 with the last ride out at 3 pm. 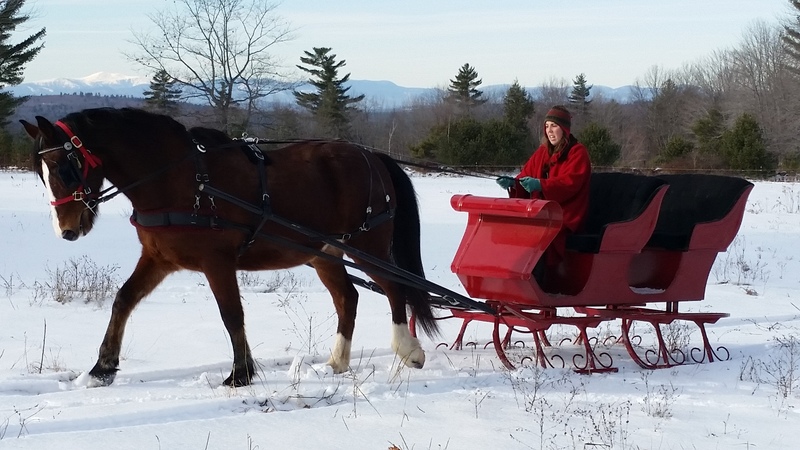 These sleigh rides will be available during the week by reservation only, $125 for a group of 8 adults or 6 to 8 adults plus 2 to 4 children under 10 ( for a maximum of 10 participants of all ages). 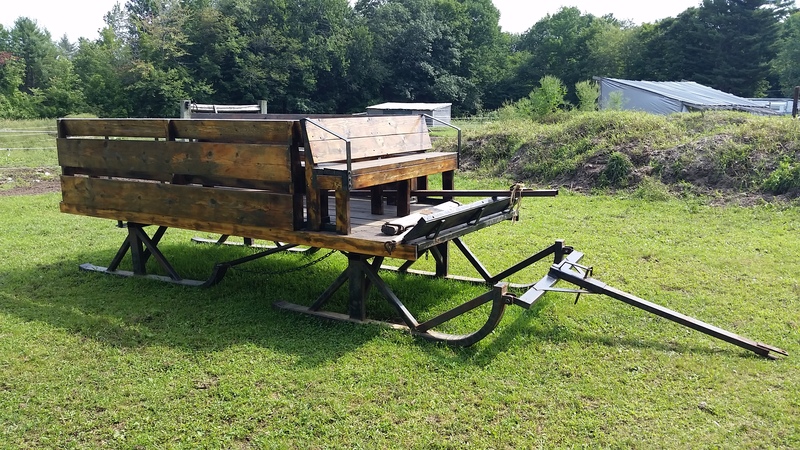 This sleigh looks just like Santa’s! With Rose, Traveller or one of the team pulling it, you will be cruising the snowy trails in style. We are hoping to offer a Friday night “date night” special for couples. With lights on the sleigh we plan to head out through the trails after dark for a special sleigh ride evening just for adults. With a minimum of 2 reservations we can do these as low as $80 per couple. These sleigh rides will be 15 to 30 minutes which will be determined by snow conditions and weather and the comfort of the participants. We also offer these sleigh rides on regular weekends from 11 to 3 at a rate of $50 per couple. Any other time of the week is a specialty ride at $125. A great way to celebrate for anniversaries, proposals and other special times in your life. We plan to offer reserved rides only on these days if conditions are right. Keep an eye out for our special deals which will include gifts and food! There is no limit to the functions that our wagons can improve! The jingle of the bells, the hoof beats, the steamy breath and mesmerizing slow motion way to see your town or family during the Christmas season. Harvest Festivals, summer fairs and private New Years community parties! Rates start at $650 for up to four hours with the wagon at your location or for public events. 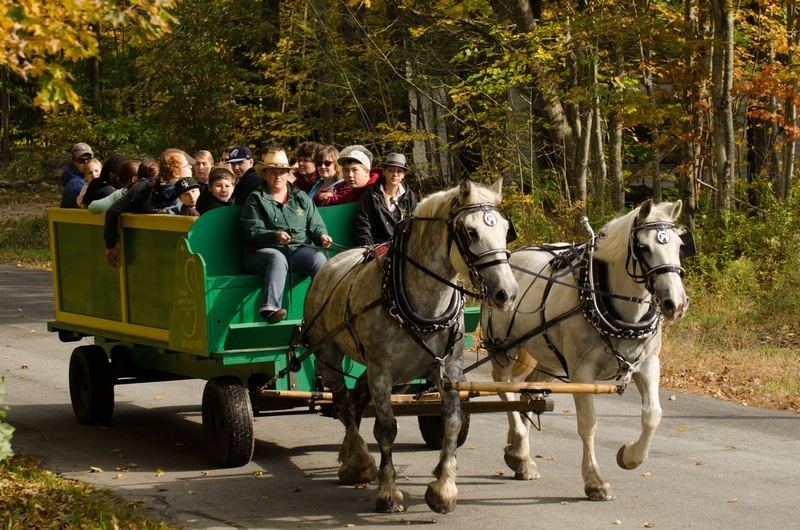 The horse drawn wagon can hold up to 15 adults and children. We also have a wooden-wheeled black and gold wagonette that carries up to 10 people. Consider us for all of your events!